WATCHED Chef the other day. “Last full show,” Jil Bocobo texted me, because Koji Bulahan still had to attend a cell group in church. With us were the Bocobo family of travellers—with Frances and Jed. I'm serious when I say they're travellers. Just recently their father, Tito Tani, went to Surallah, some 20-minute ride from Koronadal. That family has practically been to all the corners of the earth, save maybe Africa, South America, and Antarctica—and we don't know where they'll go next. I listen to their stories and remind myself that there is, in fact, a greater world out there. Lord willing, I hope I'll be able to visit some of those places in the future, too. 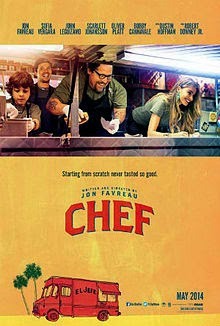 Chef is a light-hearted movie. Nothing much happens, but it's so good—so relaxing yet meaningful—that it may be a good break from studying (yes, this is for you, recent med school graduate about take the August boards). My advice: eat something first before going to the cinema. Otherwise your mouth will water, your stomach will churn, at the sight of Cuban sandwiches, Italian pasta, and American grilled cheese. The movie, too, couldn't have been more appropriate, for Jil just got back from Paris. She did an internship at a world-famous pastry store there, training under one of the world's best. “I relish the fact that I have a pastry chef-friend,” I told her. She gave me scones she baked. They were so good I had to ask for another one—impolite as that may have sounded. Before I went home she gave me cookies. I saved some of them for the next day, and I ate them with my afternoon tea. Heavenly. Best part was the fact that Chef Carl Casper (Jon Favrou) wore the same glasses that I own. Oh, to have chef friends! Please visit into my blog in NONGKRONG online or yusupajja.blogspot.com...thanks..